With the gardens of new homes getting smaller and smaller, and particularly with more and more of us living in town homes and apartments, there is a lot of interest in growing plants in planter boxes and larger pots. Perhaps you just have a patio, or a balcony large enough for a plant in the corner, or perhaps your garden is large enough to have a terrace or paved area that would benefit from some handsome planters, with suitable plants in them. Depending on the choice of plants, you can add neat, formal elements, or casual ones just as easily, to suit your personal style, and the overall look of your space. Traditional planters were filled with bulbs and annual flowers, but that means regular work several times a year, plus of course the annual cost – which adds up over ten years or so. More and more smart gardeners with limited time and lots of other things to do are opting instead to use shrubs for planters – yes, the initial investment is more than some geraniums, but the saving over time in work and money makes shrubs a sound decision. You can create permanent landscapes in larger planters, adding height very effectively, and rely on them entirely, or still add some flowers for the summer and extra color – the choice is yours. There are a few basic things to consider with planters and pots, to get good results and see your plants thrive and grow well, so let’s start there, before looking at some ideas for plants. Pots Need Drainage – The number one tip for success is to always use pots with drainage holes in them. Very few plants will grow in soggy, airless soil, and the movement of water through the soil and out the drain hole makes sure your soil stays fresh and sweet, and that salts from fertilizers don’t accumulate and cause problems. Sometimes you need to use saucers, but either empty them after watering, or raise the pots on small feet so they stand above the saucer, not right in it. With larger planter boxes too, they must drain, and a layer of gravel in the bottom is not good enough in the long term. You might need to connect a pipe to the drain hole if water on your balcony is a potential problem, and then lead that pipe away to a drain. Mostly though, a little water on the floor will soon evaporate. Choose a Suitable Soil – You cannot use garden soil in planters, so bring in some good-quality potting soil, preferably one designed for outdoor planters. If you can’t find that, then mix regular potting soil half-and-half with soil for cactus and succulent plants – outdoor planters need that extra drainage for good air flow. Watering – The secret to success in planters is to water the right way. Never give ‘a little drink’ to your plants. Water thoroughly when you do water, so that at least a little water flows out the bottom. Then don’t water until the top inch or two has dried out. In winter you may not need to water very often, and obviously more in summer. If you have a tap on your terrace, you can attach a hose and long-handled spray, and watering becomes fun. If you have a lot of planters you can set up a watering system, but unless you spend a lot of time fine-tuning it, it is often better to turn it on and off manually, rather than use a timer, unless it is connected to a moisture monitor. Fertilize regularly – Correction, watering is only the second secret to success, because the first one is to regularly feed your plants. Potting soils don’t contain the nutrients of garden soil, so feeding is a must. Depending on how you feel you can use traditional chemical fertilizers in liquid form, or organic ones, such as those based on fish-meal or seaweed. Today there are lots to choose from, and more important than what you use is simply using it regularly, from spring to early fall. The best shrubs for planters are slower-growing, more unusual specimen plants (rather than common shrubs), and there is an enormous range of interesting material to choose from. 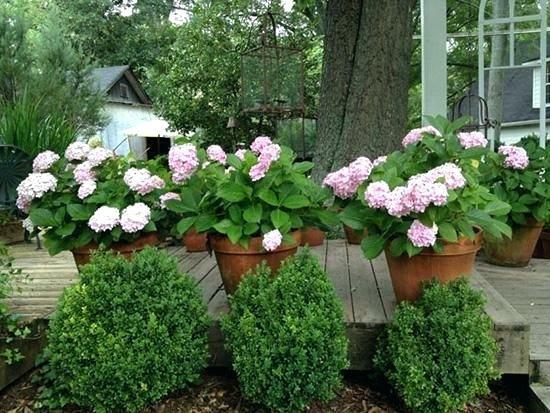 One great thing about growing in planters is that you can control the soil, so if you don’t live on acid soil, you can still enjoy blue hydrangeas, azaleas and camellias, simply by using soil blended for acid-loving plants. These soils lack the trace of lime normally used in potting soil, and often they contain other natural ingredients to guarantee a low pH. Make sure you also choose suitable fertilizer for this group too, and for hydrangeas there are special ones that help make sure you get the very best blue colors. Here are some ideas for planter shrubs – maybe not ones you might have immediately thought of. When choosing suitable plants, add a hardiness zone. If you are in zone 6, grow plants that are hardy in zone 5, and so on, because for most plants the roots are not as hardy as the top growth, and raised up in planters they can get too cold. To add some height to your arrangement, or for cascading over the edge of a beautiful tall planter, Japanese Maples are wonderful for container growing. They will always get enough water, so the leaves won’t burn, and if the pots are moveable you can control the amount of sun too. With so many different amazing varieties, choose one for form – cascading or upright, color – red or green, and size. From tiny dwarfs to larger trees for big planter boxes, this is a great way to grow these beautiful plants. As a substitute for annual flowers, roses have no equal. 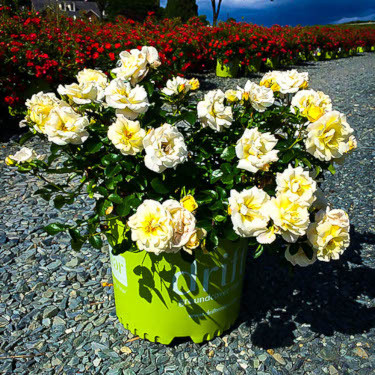 You can have blooms from late spring to fall with the Knockout series of roses, in a great range of colors, or even better perhaps for pots are the Drift Roses, with masses of small flowers, blooming continuously, on plants less than 2 feet tall. In warmer areas these gorgeous evergreen azaleas are perfect for planters. They don’t just bloom in spring, but keep blooming again, continuously, from mid-summer right into fall. This fabulous ‘encore’ makes them ideal, because you get bloom for so long, meaning annual flowers become redundant. Use lime-free potting soil for them. For easy container growing, nothing beats the wide range of dwarf evergreens. Many are upright, or rounded, for a more formal look, and can even be clipped for perfect regularity, if that is your thing. Some, like the Chirimen Hinoki Cypress and the Tenzan Japanese Cedar are so small their ideal home is in a miniature garden planted in a beautiful dish, and others, like the David Golden Yew, make delightful, bright specimens. Another group of plants for acid-loving soil, containers make perfect blue hydrangeas possible for everyone. But blue or pink, with their long bloom period, these are great choices. Don’t forget the smaller panicle hydrangeas either, like Bobo, or Little Quick Fire, which are much hardier, and change color as the seasons pass. If you don’t enjoy watering, are away for long periods, or live in desert areas, then consider some of the xeric plants, which grow as well in containers as they do in the ground, without regular watering. All the Yucca plants, and the Agaves, make great container plants, and so do other drought-resistant plants like Tuscan Blue Rosemary and Texan Sage.